STAMFORD, CT – May 5, 2016 – Today, HARMAN International Industries, Incorporated (NYSE:HAR), the premier connected technologies company for automotive, consumer and enterprise markets, announced it will showcase the industry’s first developer-ready headphones at TechCrunch Disrupt NY 2016. As the first brand to connect multiple services and open APIs to headphones, HARMAN is revolutionizing how listening experiences can be customized beyond music to include new use-cases, enabling consumers to use their JBL headphones to enjoy legendary audio as well as stay connected to the world around them and interact with other smart devices. As a sponsor of the Disrupt NY 2016 Hackathon event, HARMAN will offer developers the opportunity to “hack” the JBL EVEREST™ ELITE headphones using the EVEREST™ SDK available at the HARMAN Developer Community website: developer.harman.com. Developers are encouraged to create new use cases and applications for the EVEREST™ devices including the JBL EVEREST™ ELITE 300 and JBL EVEREST™ ELITE 700 headphones. HARMAN audio prizes, including JBL EVEREST™ ELITE 700 headphones, will be offered to the top team whose idea identifies new insight and interesting uses cases for the product. The winning team’s concept will also be considered for inclusion as a standard offering for future iterations of the JBL EVEREST™ ELITE headphones portfolio. Internet of Things Capabilities: Connect your smart home devices and appliances to your headphones via IoT hubs: imagine hearing doorbells, alerts, timers and messages through EVEREST™ headphones. Button Modifications: Developers can now customize the function of the headphone button to manage 3rd party apps and services via a physical button tap. This new UI possibility allows for a customized experience without having to reach for a smartphone. HARMAN encourages all developer teams who are interested in “hacking” their own pair of JBL EVEREST™ ELITE headphones to stop by the HARMAN sponsor table to receive their own pair of JBL EVEREST™ ELITE headphones as well as instructions for how to access the EVEREST™ SDK. Disrupt conference attendees are encouraged to stop by the HARMAN booth throughout the event for demonstrations of the JBL EVEREST™ ELITE headphones and other developer-ready products in the HARMAN portfolio. For more information about HARMAN’s Developer Community and to download the JBL EVEREST™ SDK, please visit www.developer.harman.com. 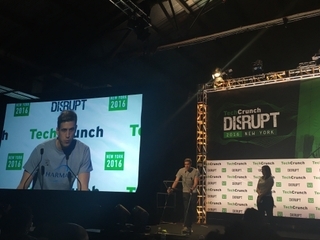 TechCrunch Disrupt NY 2016 (http://techcrunch.com/event-info/disrupt-ny-2016) is TechCrunch’s seventh annual conference in New York. The format combines top thought-leader discussions with new product and company launches. Morning executive discussions debate technology-driven disruptions in many industries, while the afternoons are reserved for the Startup Battlefield, where 20+ new companies will launch for the first time onstage, selected to present from numerous applications received from around the world. The winning company will receive a $50,000 grand prize and the Disrupt Cup at the conclusion of the conference. The conference is May 9-11 at the Brooklyn Cruise Terminal in New York.